Agronomic biofortification of Zn requires an effective Zn application method and efficient Zn utilization by the crops. Various Zn application methods were compared for Zn biofortification in grains of wheat grown in a calcareous soil under glasshouse conditions. Wheat (cv. Shafaq-2006) was treated with different Zn applications to soil (0, 4.5 or 9 mg Zn kg−1), seed (100 mL of either 0 or 6.75 % Zn w/v sprayed on 1 kg seed) and foliage (distilled-water-sprayed control, 1 mL of 0.05 % Zn w/v at jointing, 2 × 1 mL of 0.50 % Zn w/v at heading or combined jointing and heading sprays) in all possible combinations. Mineral (Zn, Ca and Fe) bioavailability to humans was estimated based on phytate-to-mineral molar ratios. Zinc bioavailability was also quantitatively estimated using trivariate model of Zn absorption. Soil Zn application increased grain yield (29 %), whole-grain Zn concentration (95 %) and whole-grain estimated Zn bioavailability (74 %). Foliar Zn application at heading also increased Zn bioavailability, but progressively less so with incremental soil Zn rates. Soil Zn application increased grain concentration and bioavailability of Ca, but decreased them for Fe. 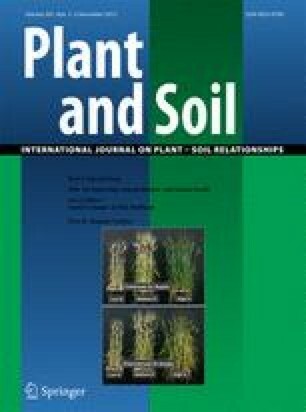 High soil Zn application increased estimated Zn bioavailability to humans. Also, medium soil Zn rate may be combined with foliar Zn sprays at heading where high soil Zn application is not feasible because of economic or environmental reasons. We acknowledge Leland V. Miller, Senior Professional Research Assistant in the Department of Pediatrics, University of Colorado, Denver (Aurora, Colorado, USA), for his guidance with the trivariate model of Zn absorption. The research project was financially supported by Higher Education Commission of Pakistan through Indigenous PhD Fellowship and International Research Support Initiative Programs.